A giant loggerhead sea turtle was found dead on the coast of western Turkey's Balıkesir province on Monday. 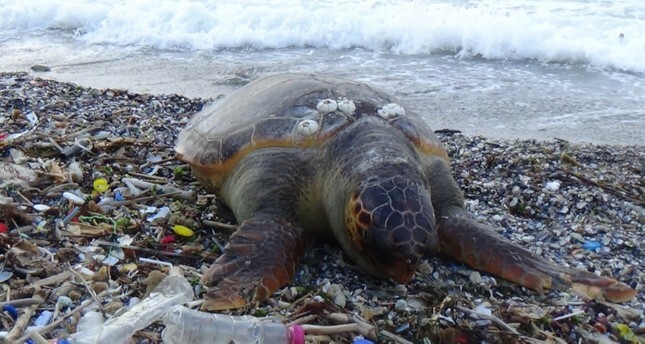 The 1-meter-long sea turtle, known by the scientific name Caretta caretta, washed up on the Marmara Sea shore in the Bandırma district, where it was found by locals. The endangered animal's carcass was taken to the maritime faculty of Bandırma On Yedi Eylül University for examination after university officials were informed of the incident. Maritime Faculty Dean Mustafa Sarı said that these animals love warm waters and frequently use hot currents to move during their migration periods. Sarı said that in this time of the year, which is breeding time for the loggerheads, they start to come ashore. This unfortunate loggerhead probably got caught in a current in the Dardanelles in northwestern Turkey and entered the Marmara Sea from there, Sarı said, adding that the sea turtle weighed about 50 kilograms (110 pounds). Caretta caretta is an endangered species with vulnerable status. Turkey's beaches, most famously Iztuzu Beach in southwestern Muğla, are popular breeding grounds for loggerheads, but these natural areas are also threatened by tourism. However, thanks to efforts by scientists and activists and increased public awareness, many loggerhead breeding grounds have been closed to tourists during the breeding season and regulations put in place to protect the sea turtles' nests and natural habitats.